Rainy days and restless, whiny kids are synonymous. You want them to go outside, they want to go outside, and the clouds and the mud are keeping everyone cooped up. No fresh air, no break, and you're praying for bedtime. But what if you looked forward to the rain? Or at least had an arsenal of fun activities to pull out when the weather turned bad? We've compiled just that list for you, to keep your little ones busy and you from losing your ever-loving mind. 1. STORY TIME: Everyone wants well-read kids, so use the storm clouds to inspire a love of reading. Have the kids run for their favorite books, cozy up on the couch, & commit to staying there longer than you usually do. Bonus points for funny voices and reading in accents! 2. BUILD A FORT: Every little kids loves their own small play space. 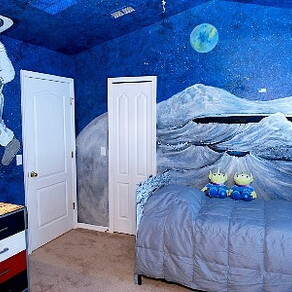 Pull out the kitchen table, use the chairs, stretch blankets & sheets, grab all the stuffed animals, get the flashlights. Start inside with them, then once the play is rolling, sneak out for a cup of coffee and a square of chocolate for your own well-deserved mommy time. 3. PULL OUT THE PLAYDOH. Think past the clean up right to the hours of independent play. (And if you don't have any playdoh, make some. 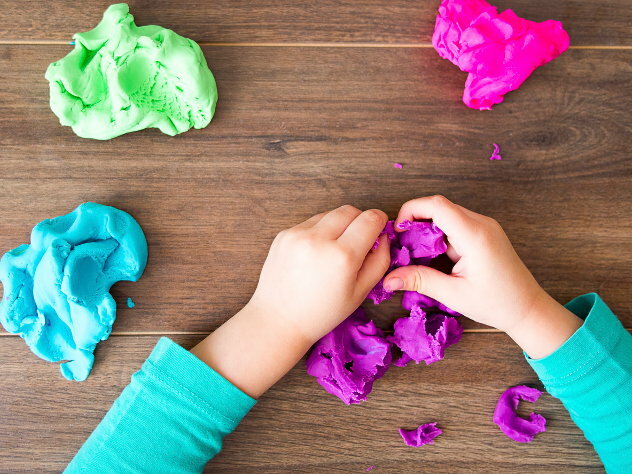 The interweb is full of simple playdoh recipes, from gluten-free ones to versions scented with essential oils. Then pull out the cookie cutters & set up a kid bakery, or make teeny people & tell a story with the characters. Bonus points: have the kids “make” themselves a snack or plan dinner tonight! 4. FINGER PAINT. Remember that stash of finger paints you have on the highest shelf in the closet? Spread newspapers across the kitchen table, tape down the edges, strip shirts off the littlest ones (or use an old shirt for a paint smock), & then pull down those paints & let the kids release their inner Picassos! Afterward, help them create a “museum” of their favorite pictures on the fridge door. 5. PLAY WITH BEANS. Any kid over two-years-old will love dumping beans into containers, sorting them, or hauling them in toy trucks or cars. You can contain the mess in a kiddy pool or let them free-range on the carpet. Bonus points: easy clean-up! Just vacuum or sweep up the beans. 7. BAKE COOKIES. 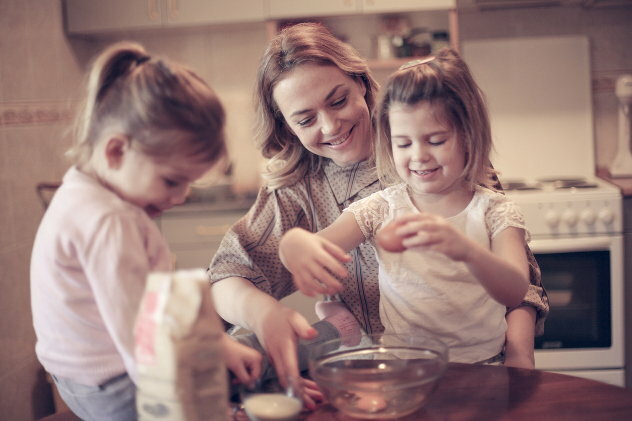 A rainy afternoon is a perfect opportunity to make a happy mess in the kitchen for the sake of a yummy treat & a great memory with your little ones. Look at the pictures in a cookbook together & ask them to help you pick the recipe you should make. Then involve them as much as possible (or as much as sanity allows!) in the dumping, the stirring, & the tasting. Bonus points: sit down at the table with them to eat cookies and milk after they've helped you clean up! 8. DRESS UP. Let the kids into your closet & your stash of shoes or stick with their own dress-up clothes, designate an end of the living room as the stage, & put on some upbeat music for your kids to "walk the stage". Bonus points: get in the action yourself & showcase that vintage dress or those platform shoes! Dance moves optional! 9. HAVE A MOVIE MARATHON. After an activity or two (or anytime you just can't handle the chaos), choose a movie or two and let the screen roll WITHOUT the mommy guilt. Bonus points: put in a bag of microwave popcorn and let them eat it on the couch! 10. ACTUALLY GO OUTSIDE: If the rain is warm and you can tolerate the mess on the other end, suit up in rain coats and go out into the rain. Use umbrellas & be explorers braving the elements, and if it's warm enough, jump in puddles! Then come inside for a cup of cocoa. Bonus points: make paper boats beforehand to float in puddles and extend the activity! Rainy days don't have to be dreadful. You CAN turn them into memories your littles will hold onto with just a little creativity and a dose of your sweet mama energy!